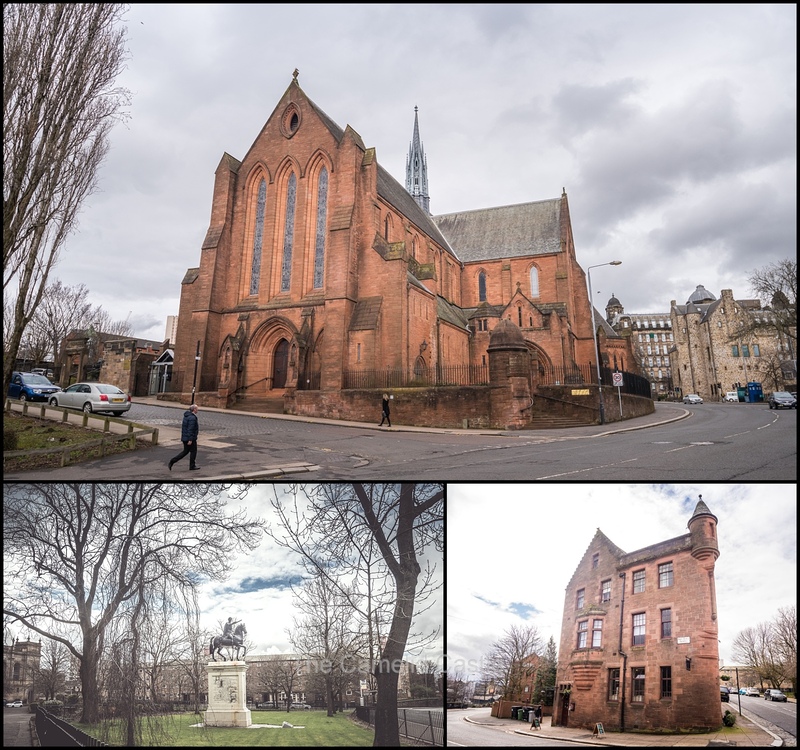 Our first couple of days in Glasgow were spent exploring some of the inner city buildings, parks and churches. 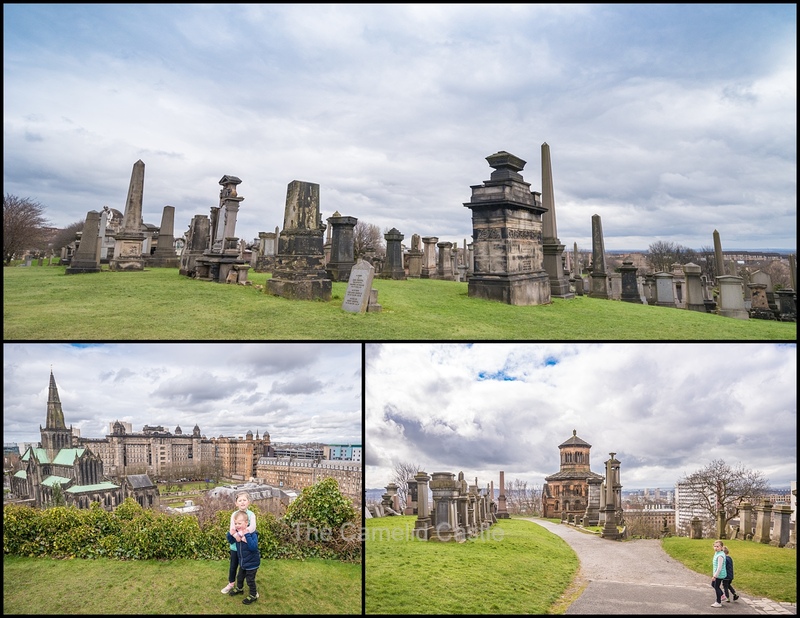 With a visit to the Necropolis for lovely views over the city, plays in Glasgow Green park, and plenty of time for playing and eating! Despite the opportunity for a sleep-in the kids were predictably awake by 7.15am. Anto had to go down and move the car bright and early since we could only park out of the front of the building until 8am. This involved driving around a few city blocks to find some expensive parking until it was time to go to work. We were all feeling rather weary after a hectic few weeks and a rather busy time in Iceland. Unfortunately for Anto he as to get organised to go to work, while I had the probably even less inspiring job of trying to keep the tired children alive for the day. Once Anto was off to the office, the kids got to play while I continued to unpack and sort out washing. After 11 days without washing, we had to wash pretty much everything and it was going to take a couple of days. By 10am the kids were ready to head out of the confines of the apartment, so we went off for a wander. It was a fairly pleasant temperature (at least compared to Iceland) of around 10 – 12 degrees. 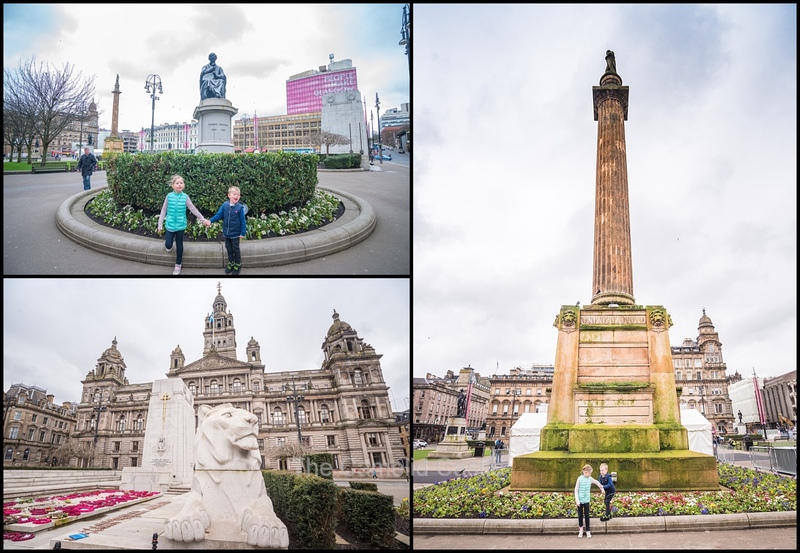 Our first stop was George Square which is right next to the apartment, so didn’t take a lot of finding! George Square is the principal civic square and is named after King George III. 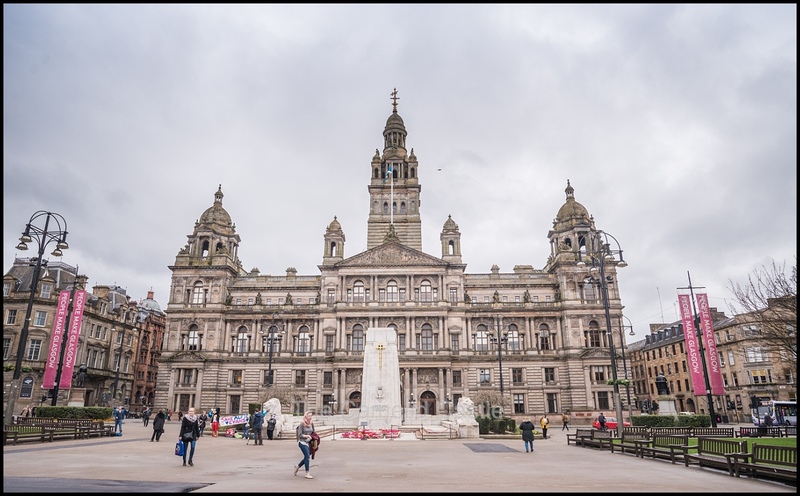 Laid out in 1781, George Square is surrounded by architecturally important buildings including on the east side the large Municipal Chambers, also known as the City Chambers, whose foundation stone was laid in 1883. The kids were mostly excited by the fact that there was grass and flowers! 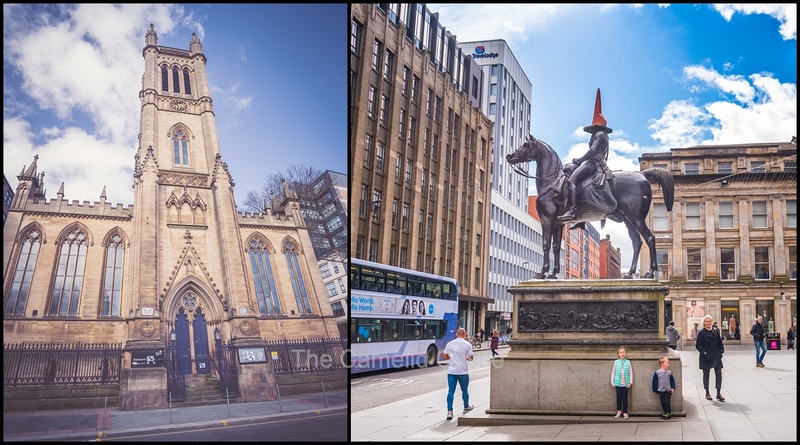 We walked through the square and then headed up the hill in the direction of the Glasgow cathedral. 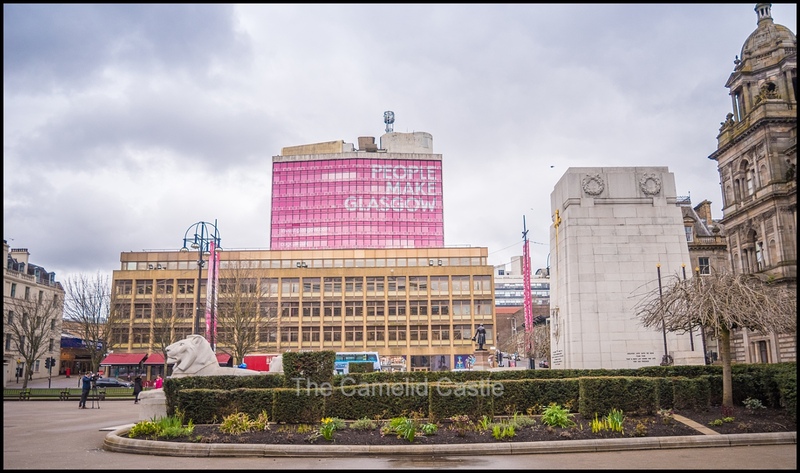 Pretty soon we happened across a couple of the large murals adorning city buildings which form part of the well-known Glasgow City Centre Mural Trail. 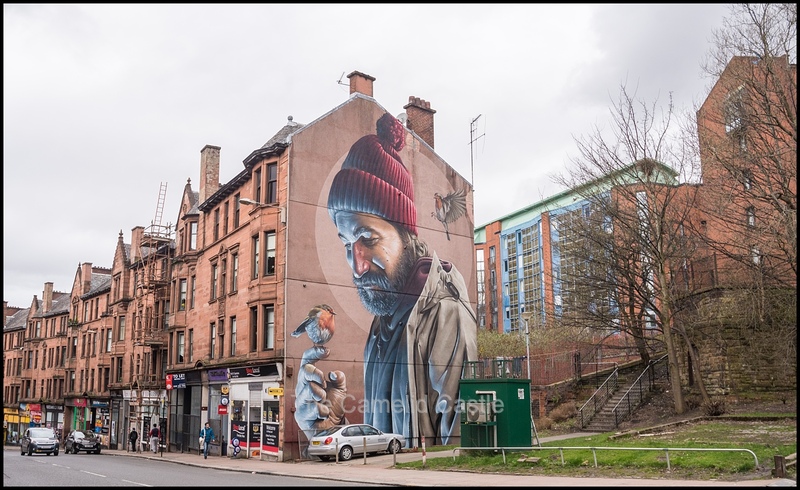 There is a published walking route covering all the murals in the city and we planned to check out as many as we could during our stay in Glasgow. 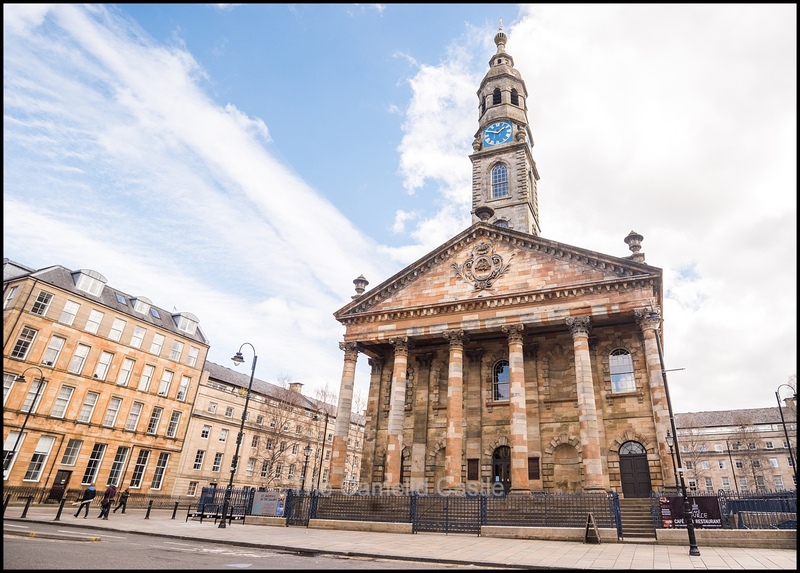 Glasgow is full of pretty buildings and grassy squares and quite a few churches so we had a few photo stops on the way to the cathedral. 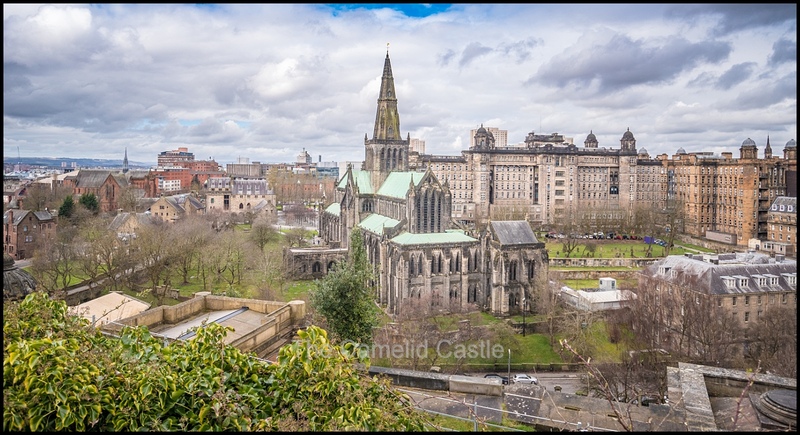 Pretty soon we reached Glasgow Cathedral, also called the High Kirk of Glasgow or St Kentigern’s or St Mungo’s Cathedral, just because 1 name clearly isn’t enough! With its green roof and enormous size it’s hard to miss. 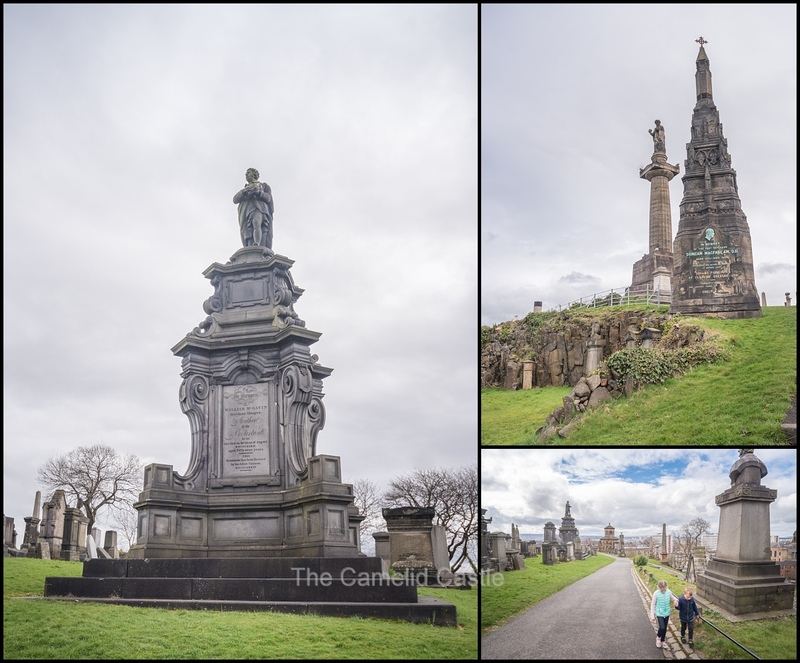 We walked past the cathedral and further up the hill into the Necropolis. 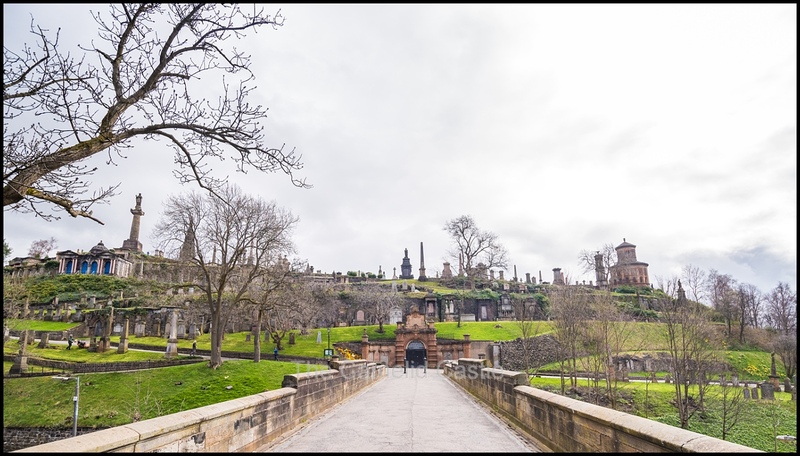 The Necropolis is built on the hill to the East of the cathedral and has reportedly 50,000 individuals buried within it, although only around 3,500 have marked graves or monuments. The paths of the Necropolis wind their way up the hill and the kids enjoyed exploring the different ways we could get to the top. There was plenty of grass and flowers planted out within the Necropolis and with the huge and often showy monuments it was a rather scenic walk. As we wandered around the kids were happily chatting and planning their play for the day. While they were running off some energy and well away from any traffic I could read some of the tombstones which were interesting. 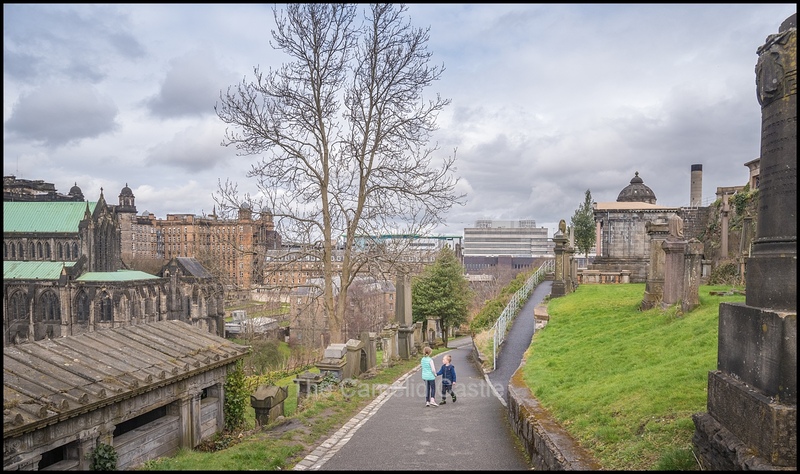 Once we reached the top of the hill there were some fairly spectacular views over Glasgow and of the cathedral. 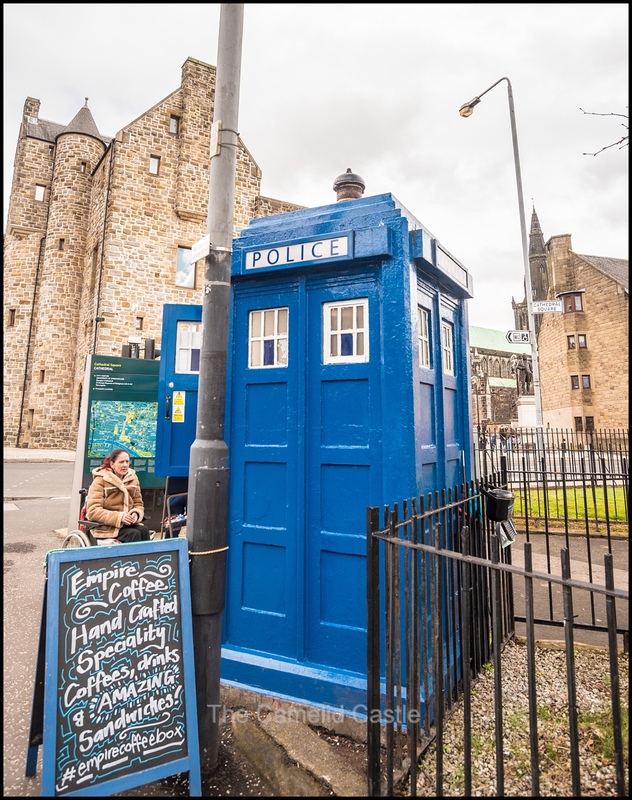 Although I could have spent half a day reading the tombstones we did wind our way back down the hill and through the grounds of the cathedral, discovering a very cute Police Box that is now set up as a cafe! I managed to find my way back to the apartment without getting horribly lost. We had some lunch and the kids had some play time while I dealt with more washing. 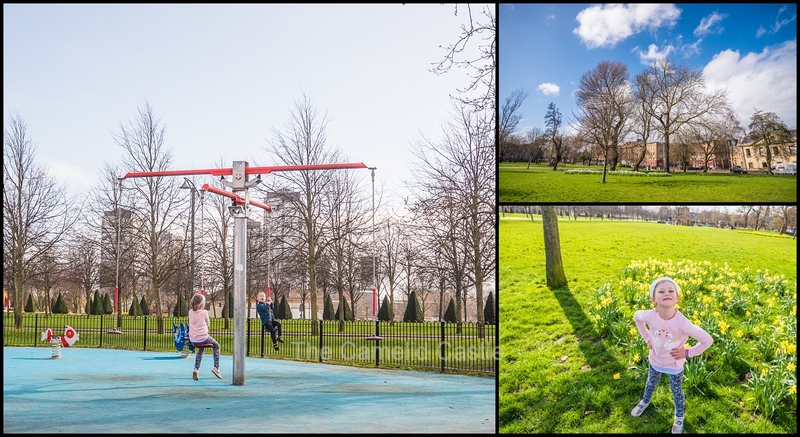 The weather was still fairly good so I convinced the kids we should make the most of it and wander in the opposite direction to see what we could find (OK so I bribed them with trying to find a park). Our first stop was the Gallery of Modern Art building (GOMA) and then Exchange Square. It was around 1.30pm so the whole area was busy with office workers out for lunch and enjoying the sunshine. There were plenty of interesting buildings to look at statues to discover. We wandered down towards the River Clyde, discovering plenty more murals on our way. 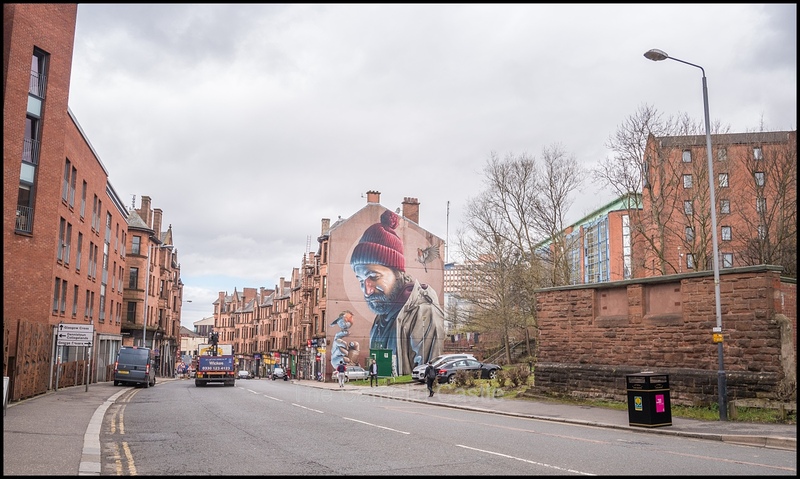 Glasgow has embraced concept of street art to promote the city centre, reduce the negative visual impact of land and unit vacancies due to the current economic circumstances, and provide features that will attract more visitors. The first murals appeared in 2008 and many more have been added since. There is a published walking route and an app to help you find the murals. 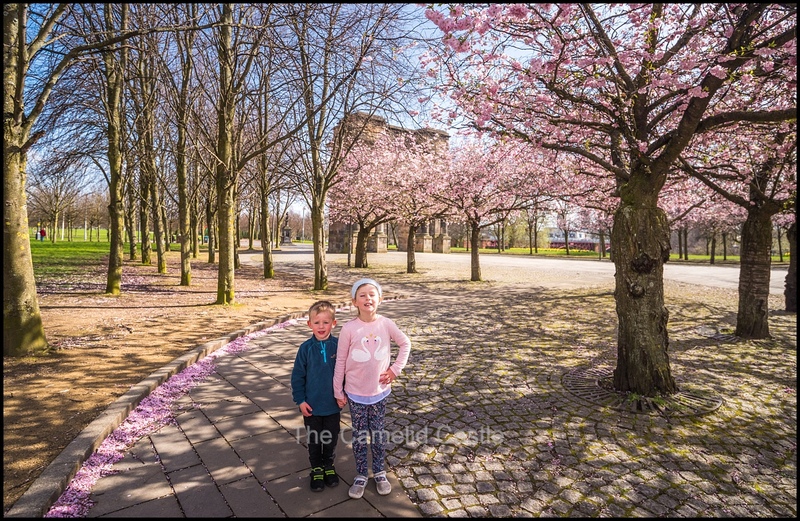 We managed to find a fair few of them during our wanders through the city area without really trying and it was like a giant game of hide and seek for the kids. 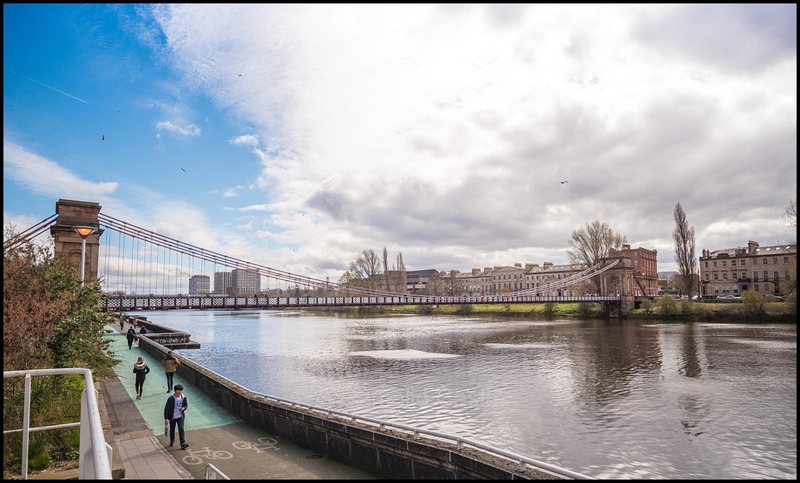 We reached the River Clyde and walked along the river towards St Andrew’s. It was a beautiful Spring afternoon and it was nice wandering around without any real agenda. 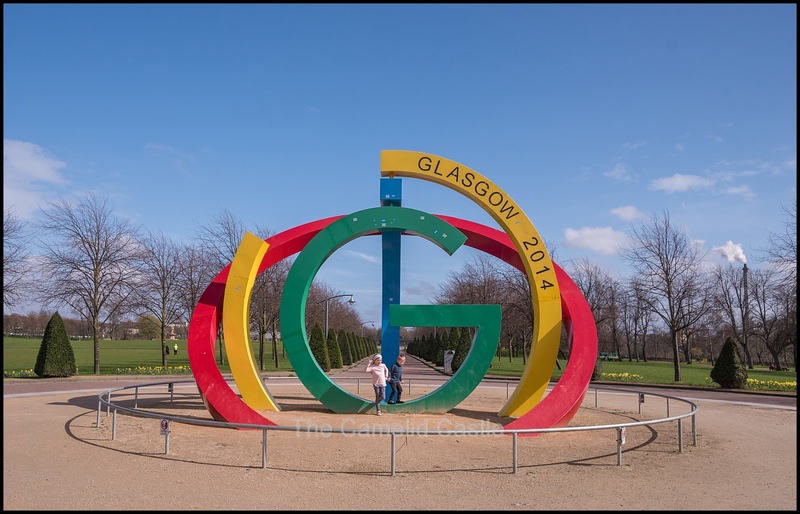 Of course the kids were still intent on finding a park, but I’d discovered signs pointing to Glasgow Green, a large park, so we were heading in that general direction. 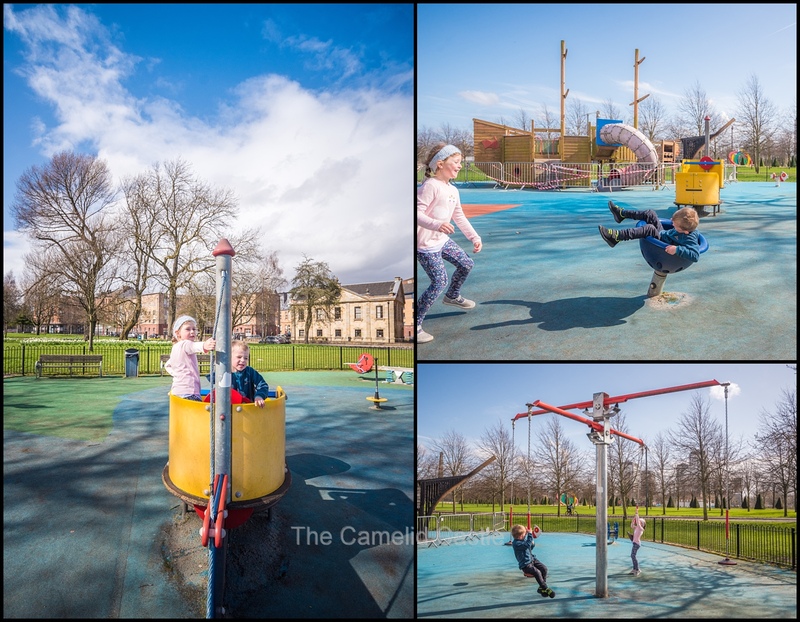 At Glasgow Green we saw plenty of daffodils and blossoms but the kids spied the play equipment so I was quickly outvoted on what to look at and they were off for a play. After awhile in the park both kids were getting very tired after a big few weeks so I convinced them we should head back to the apartment for some quiet time before dinner. On the way back we stopped past a supermarket for a few dinner supplies. I was ecstatic that everything seemed so cheap compared to Iceland and I managed to obtain more than enough supplies for a couple of days for under 10 pounds. 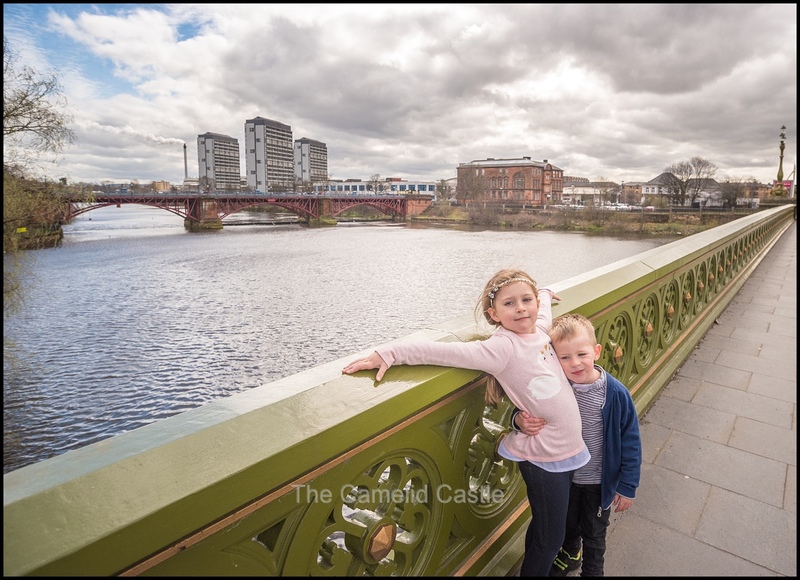 The kids were more than happy to play in the apartment for the afternoon and aside from both having meltdowns at various times due to being a bit tired, I kept them alive and relatively entertained until Anto got home from work (after a battle with Glasgow traffic). We enjoyed being able to cook dinner in a full kitchen and the luxury of an early night without having to make too many plans for the next day. Sadly Anto had to get up early for work, no rest for the wicked! It was a rainy and windy day so the rest of us hid inside while I did yet more washing and the kids watched some Scottish children’s TV (which they claimed wasn’t any good but were giggling non-stop along to). The previous afternoon they had requested we head out to the shops to buy some stationary to help with their elaborate paper and drawing games. The lack of toys with us didn’t seem to be a problem, they were more than happy to amuse themselves with some drawing and craft. The weather had improved marginally, although it was still raining and cold. 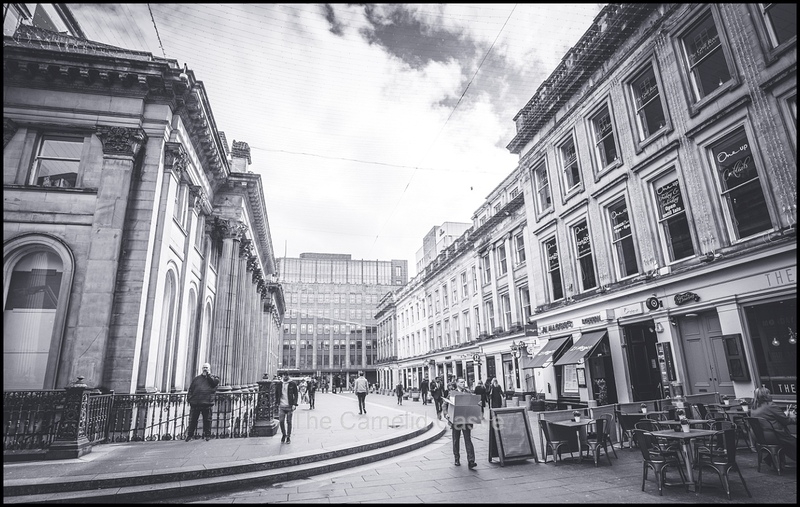 We decided to head out anyway and wandered down to St Enoch shopping centre once it opened. We had a little wander around shops and then found a craft store and purchased some more pens, paper and glue to keep the kids amused. I decided it was a good investment of a couple of pounds to keep them entertained. It had stopped raining but the wind was vicious so the kids voted they wanted to play inside for a bit. We made a quick stop past Aldi to pick up some dinner supplies, and snacks, taking advantage of cheap food and the relative availability of vegetables! 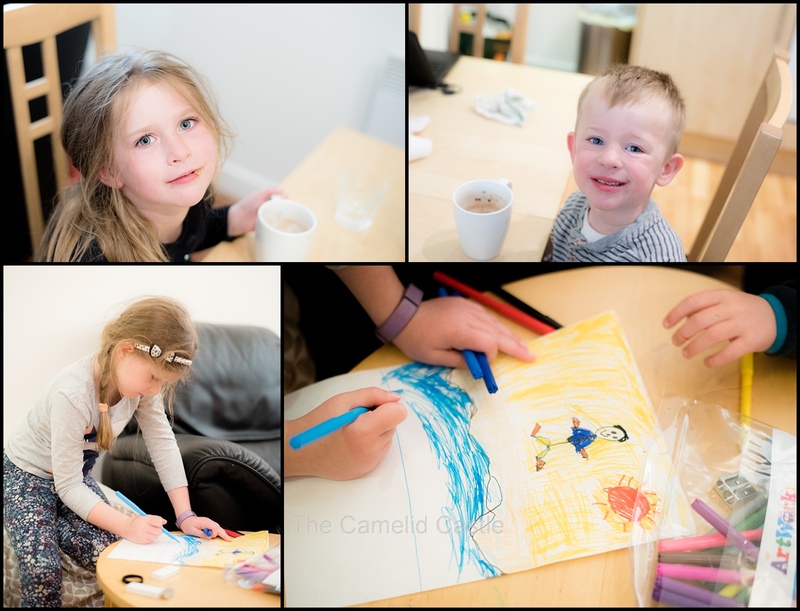 This was probably for the best as vegetables were a little lacking again once we reached the Scottish Highlands the following week…..
Once in the apartment the kids amused themselves colouring and drinking hot chocolates, relishing some down-time from non-stop tourist activities. They were happy playing all afternoon but the sun had come out so I convinced them to go for another walk, even if it was just so I didn’t go stir-crazy. Luckily the lure of the park was strong. 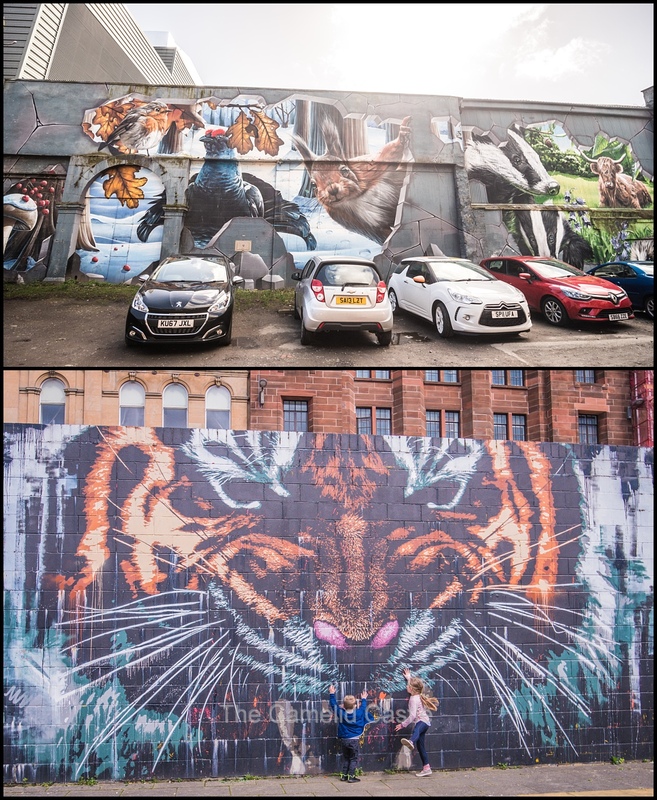 Today we went the slightly more direct route, past a few more murals, and down to Glasgow Green for a play. It was nice to be out and about without coats on, oh and there are trees in Scotland, it was so strange to see after Iceland. 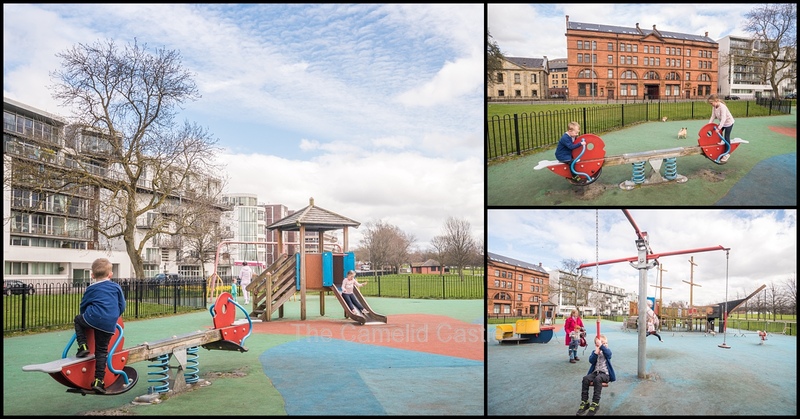 The kids enjoyed a run around in the grass and daffodils and a play in the park area. They did try to talk to a few local kids but kept complaining that they weren’t ‘speaking English’. To be fair the locals couldn’t understand a wee word we said either! I did manage to have a few conversations with locals who seemed thoroughly confused at the Spring-like weather. By 4.30pm I had to extract both kids and walk back to the apartment. Both were definitely getting over-tired as evidenced by Soren’s 20 minute tantrum on the way back about not wanting to have his photo taken in front of the daffodils and missing out on a getting the yellow mentos lolly that he had refused to eat and then decided he wanted after I ate it! The joys of over-tired kids……. at least we had made it out of the apartment for a bit and I managed to keep him alive until we got back. Despite the availability of pubs and restaurants near the apartment, it was quite late by the time Anto had his nightly battle with Glaswegian traffic, and finding a parking spot, so we again opted to eat in and have an early night for the kids. 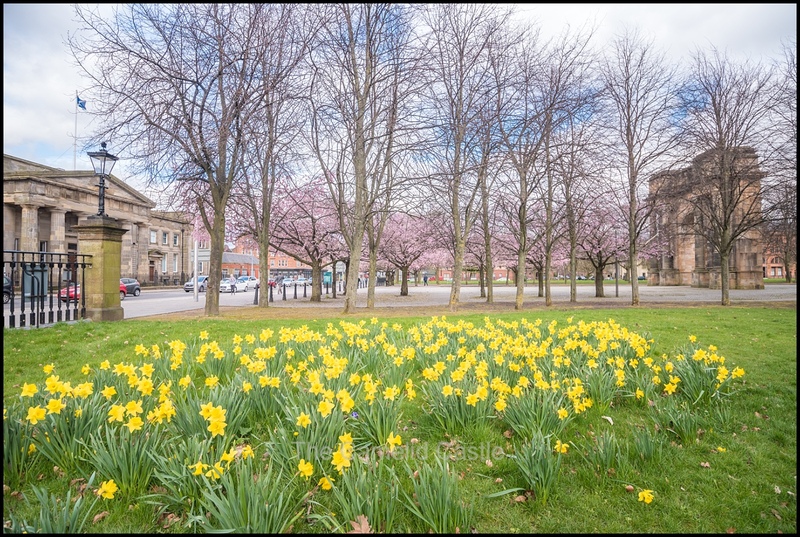 Daily statistics for the 16th and 17th of April, 2018 in Glasgow, Scotland – the temperature range for Tuesday the 16th of April was 8 to 13 degrees, with an average of 10 degrees and sunny. Wednesday the 17th of April was 10 to 16 degrees with an average of 13 degrees and 50km/h winds and rain in the morning (but beautiful sunshine in the afternoon). Definitely more Spring like weather than either Paris or Iceland! The total walking for the day was 10.05km on the 16th and 9.75km on the 17th. Those wanders around the city and to parks added up! 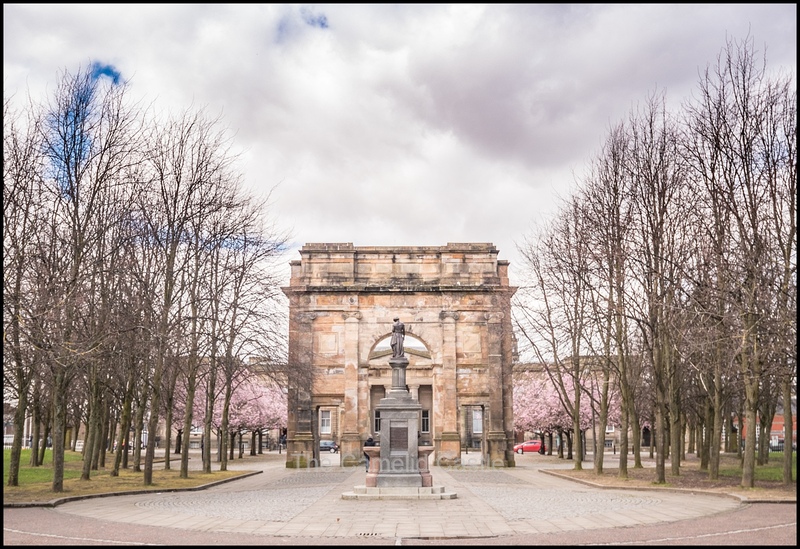 Up next, we ventured further afield in Glasgow visiting some of the amazing free museums in the area – the Kelvingrove museum and park and the Riverside transport museum. We also ventured out of Glasgow with a trip to Stirling for a dinner with friends, and an evening horse ride for 2 very excited kids! 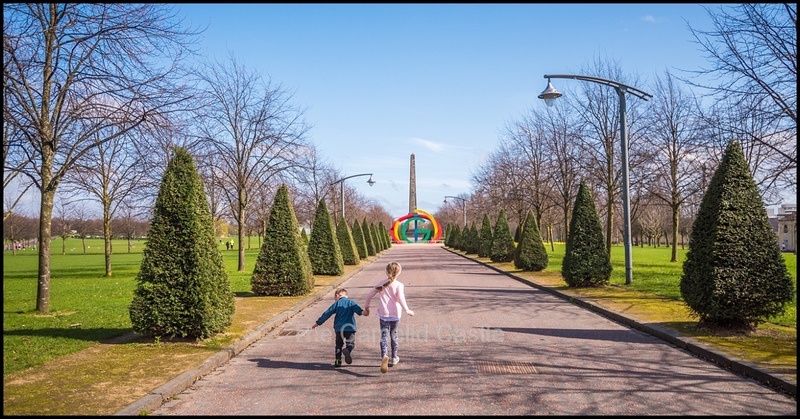 Posted in 4 years, 6 years, Astrid, Glasgow, Glasgow Green, Glasgow Mural Trail, kids, Necropolis, Park, Scotland, Soren, Spring, Travel, travelling with kids, UKBookmark the permalink.